Join us at VCC 2019, Visibility's Annual Customer Conference, to stay current on Visibility best practices, strategies, and solutions! Our conference offers Visibility and customer led educational sessions, individualized appointments with Visibility experts as well as an open product lab staffed with Visibility experts, and collaborative sessions such as focused roundtables. VCC 2019 Agenda available now! Click here to download. VCC 2019 Session Descriptions here. Click here to download. Sign up for the VCC 2019 Golf Outing. Register here for more details. Evening Events: Settings to inspire lasting business relationships. Join us outside at the Koi Pond Garden at the Westin Hilton Head Island for our Welcome Reception from 6 pm - 8 pm on Wednesday, April 10th! On Thursday evening, come with us to the Harbour Town Yacht Club for dinner, entertainment, and stunning views of the Harbour Town Lighthouse. PLEASE NOTE there is a dress code for this event - Men can wear slacks, neatly tailored jeans, golf or Bermuda type shorts, collared shirts (dress shirt, polo shirt or golf shirt), sweater or any other attire permitted on the golf course. Women can wear slacks, neatly tailored jeans, golf shorts, skirts, dresses, blouses, sweaters or any other attire permitted on the golf course. Sneakers are permitted! Please no hats inside. There is no dress code for any other portion of the conference. Registration Details: Conference fees are $895 per attendee. See below for our discounted registration rates for early registrations and groups! Register by December 31st for $495! Our biggest early registration discount yet! Register by January 31st for $725! Register by February 28th for $795! Send 3 attendees and pay only $600 for the 3rd! Please visit our Hotel and Travel Information page for more details on the Westin Hilton Head, traveling to Hilton Head, and top Hilton Head activities. Our Conference Details Page is a great resource for all things VCC 2019, including a description of our 3 tracks and sessions as well as a look at what to expect from each of our social events offered during the program. The Westin Hilton Head Island Resort and Spa: Host of VCC 2019. Perched on Hilton Head Island's famous white sand beaches and nestled amidst swaying palmetto trees, The Westin Hilton Head Island Resort & Spa offers travelers a true tropical oasis. Enjoy the array of inspired amenities available at our Hilton Head Island resort, including private beach access, three beautiful swimming pools and four on-site restaurants.Children will love spending time at the Westin Family Kids Club, while you can escape to the Heavenly Spa by Westin™ for a rejuvenating massage. We also offer hotel guests access to the adjacent Port Royal Golf & Racquet Club for championship golf and tennis. Reservations can be made online here or by calling 1-800-937-8461 and referencing the Visibility Customer Conference to get our special group rate of $184/night plus a $10 daily resort fee. This rate is available three days pre and post event subject to availability. Please feel free to contact us at 978-269-6500 or at customerconference@visibility.com with any questions! We look forward to seeing you in Hilton Head, South Carolina! Q: Where are we staying and when are we going? 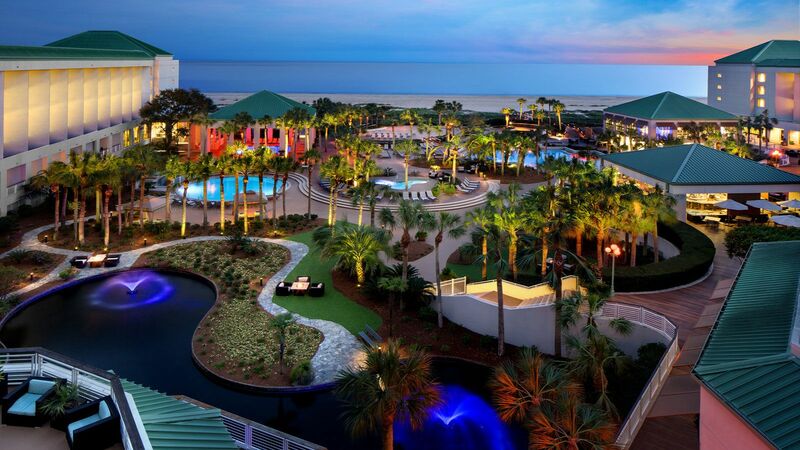 A: We are staying at the Westin Hilton Head Island Resort & Spa. The conference will take place from April 10-12, 2019. A: Now! Take advantage of our discounted prices for early and group registrations! Click here to be taken to our 2019 registration page. Q: How can I reserve my room? A: Reservations can be made online here or by calling 1-800-937-8461 and referencing the Visibility Customer Conference to get our special group rate of $184/night plus a $10 daily resort fee. This rate is available three days pre and post event subject to availability. Q: How much is the conference per attendee? A: The cost per attendee is $895 per person. Sign up early or as a group for discounts! $495 until December 31, 2018! $725 until January 31, 2018 and $795 until February 28, 2018. Send 3 attendees and pay only $600 for the 3rd! A: Absolutely! Guests are welcome to come to the opening sessions, all meals, and our evening events. You can bring up to 2 guests for $300 per guest. Click below to contact us with any questions concerning VCC 2019. We look forward to hearing from you!